An amazing book with a luxurious number of colour and black-and-white pictures. I knew nothing at all about Jansson’s life. The book was a bit puzzling at times as I knew very little about Finnish / Swedish twentieth century history or artistic movements (Jansson was the daughter of artists), but definitely worth reading. Interesting things include how Jansson related to people, the tension between children’s and adults’, serious / playful art or writing, how her work was seen, and her urge to write and re-write, re-imagine or re-tell her past and present, including using real people and events very clearly in her work. I’ve also been reading a biography of Stevie Smith, and she also uses friends recognisably in her writing (sometimes leading to them ceasing to be friends). 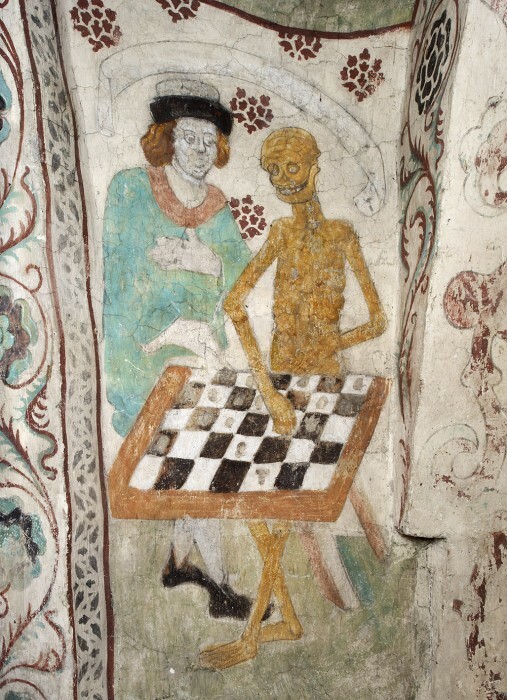 Mentions a fifteenth century church mural by Albertus Pictor of Death playing chess with a knight. Something missing for me – and this may be to do with being an ignorant reader – was little sense of how Jansson came across to people, what people who knew her thought of her. It’s only in the last paragraph of the Acknowledgements that Westin, who knew her well, writes “Tove Jansson was at the same time open and secretive, intimate and distant, in a manner all her own”. The archive and studio Jansson left sounds incredible for her biographer, containing over fifty years of work and life, and Westin implicitly returns to it in the last few words of the book in a sort of Strachey’s Victoria and the rug way, looking back to Jansson’s parents’ studio where bookshelves reached to the ceiling “and she was free to search all the way from the big art books at the bottom near the floor up to the novels and poetry … as she put it herself, ‘to find the Pictures and the Words: the things that will never end’”. DC Daking and Hilary Clare, 2011. The book has two subtitles, the other being “The Journal of a Caravan Trip from Oxford to Stratford-upon-Avon in the summer of 1914”. Daking adds “His name is J.H. Townsend. Middle Tysoe. General Dealer – & he has a hat of the same make as Alec’s”. This is half the journal of Daking and friends’ travels in a caravan in July – August 1914, and half notes by Clare on Daking’s life and the people mentioned in the journal. Daking is the Pixie in Oxenham’s Abbey books. Quite a depressing book. You are currently browsing the Books and Pictures blog archives for June, 2014.